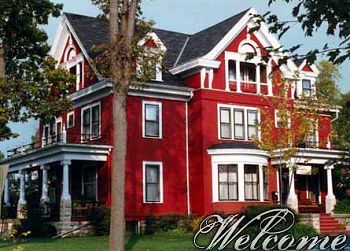 Franklin Victorian Bed & Breakfast is proud to be an environmentally friendly Wisconsin bed and breakfast. We are a "Certified Travel Green Wisconsin Destination" by the Wisconsin Department of Tourism! Franklin Victorian Bed and Breakfast Inn in Sparta, WI, "The Bicycling Capital of America". Come experience a refreshing change from typical hotel lodging. Our inviting accommodations and abiding sense of hospitality promise welcome, rest, and renewal to one and all. The inn is located in the heart of the Hidden Valleys of Southwest Wisconsin, a romantic getaway so quiet and beautiful. Our celebrated rivers, driftless rugged hills, scenic farms, tranquil back roads, bike trails, crystal air, and friendly people combine to make Sparta, Wisconsin the ideal place to be warm...be welcome...be at home. If murder mystery weekends appeal to you, The Franklin Victorian Bed & Breakfast Inn hosts them January through April. Come for a fun and exciting weekend of mystery and intrigue. When you stay at the Franklin Victorian Bed & Breakfast, you may choose from 4 lovely guest rooms, all with private en room/suite baths and some guest room's features include jetted whirlpool tub, showers with body spray massage, fireplace all guest rooms/areas have air conditioning. Full, One of a kind Multi-Course healthy and hearty breakfast, is included in all rates. Some provide a room; We provide and Experience. Come and stay and see for yourself why our bed & breakfast is one of Sparta's true treasures. "Bed, Breakfast, Bike & Beyond! be warm...be welcome...be at home..."
This and other Wisconsin Bed and Breakfast Inns can be found here online in The Register.